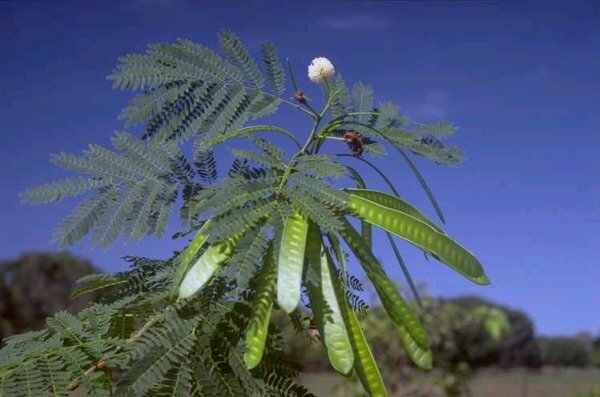 The fast-growing, nitrogen-fixing tree/shrub Leucaena leucocephala, is cultivated as a fodder plant, for green manure, as a windbreak, for reforestation, as a biofuel crop etc. Leucaena has been widely introduced due to its beneficial qualities; it has become an aggressive invader in disturbed areas in many tropical and sub-tropical locations and is listed as one of the ‘100 of the World’s Worst Invasive Alien Species’. This thornless tree can form dense monospecific thickets and is difficult to eradicate once established. It renders extensive areas unusable and inaccessible and threatens native plants. The genus Leucaena is distinguished from all other Mimosoid legumes by its hairy anthers which are easily visible with a hand lens. Leucaena leucocephala is distinguished from other species of Leucaena by its intermediate leaflets and large pods in clusters of 5-20 per flower head. It forms a small to medium-sized thornless tree 3-15 (-20)m tall and 5-50cm bole diameter. The leaves are bipinnate with an elliptic convex extrafloral nectary on the petiole, 4-9 pairs of pinnae and 13-21 pairs of leaflets per pinna. The leaflets are 9-16mm long and 2-4.5mm wide, nearly sessile and strongly asymmetric linear oblong and acute at the apex. The flowers occur in 12-21mm diameter heads, are cream-white, with ten free stamens per flower and hairy anthers. The pods occur in crowded clusters of 5-20 per flower head and are 11-19cm long and 15-21mm wide pendulous, flattened and papery, and passively dehiscent with 8-18 seeds per pod. Three subspecies are recognised, two of which - subsp. leucocephala and subsp. glabrata have been introduced pantropically. These two subspecies correspond to shrubby = subsp. leucocephala variants, sometimes referred to as the Common or Hawai‘ian type, and to the more arborescent = subsp. glabrata variants, sometimes referred to as the Giant or Salvador type. Trees are generally short-lived (20-40 years). The hard seed coat means that germination occurs over a prolonged period after seed dispersal and that seed can remain viable for long periods (at least 20 years) in the soil. Leucaena leucocephala is a weed of open (often coastal or riverine) habitats, semi-natural, disturbed, degraded habitats and other ruderal sites. It was assigned to the category of 'a serious or widespread weed invading semi-natural or natural habitats which are of some conservation interest' by Cronk and Fuller (1995) and as a Category II weed (a species which has a local distribution but either expanding populations, or known potential to invade and disrupt native vegetation elsewhere) in Florida by Gordon and Thomas (1997). It is not known to invade undisturbed closed forest habitats. It tolerates a wide range of rainfall from 500 - 3500mm and withstands strongly seasonal (6-8 month dry season) climates. However, it is not frost hardy and grows poorly, setting less seed in cooler tropical highland sites. The species also grows poorly on the acid soils with high Aluminium saturation that prevail in many humid tropical areas. In broad terms, it thus adapts well to a wide range of tropical and subtropical environments, especially seasonally dry tropical areas. Self-fertile (promoting seed production even on isolated individuals), some outcrossing, pollinated by a wide range of generalist insects including large and small bees. Resprouts after cutting. Flowering and seeding continually thoughout the year as long as moisture permits combined with self-fertility promotes abundant pod and seed set. Widely promoted by national and international agricultrual and forestry development agencies for agroforestry and agricultural use.Introduced by acclimatisation societies. Review: Dr. Colin Hughes, Department of Plant Sciences, University of Oxford, OXFORD, UK. Recommended citation: Global Invasive Species Database (2019) Species profile: Leucaena leucocephala. Downloaded from http://www.iucngisd.org/gisd/species.php?sc=23 on 19-04-2019. Leucaena leucocephala is spreading naturally and has been reported as a weed in more then 20 countries across all continents except Europe and Antarctica. It is a weed of open, often coastal or riverine habitats, semi-natural, and other disturbed or ruderal sites and occasionally in agricultural land. It can form dense monospecific thickets which are reported to be replacing native forest in some areas and threatening endemic species of conservation concern in some areas. Dense thickets, even if not of immediate conservation concern can render extensive areas of disturbed ground unusuable and inaccessible. Preventative measures: In Queensland, Australia, management practices aimed at minimising the risk of spread and invasion are being promoted under a code of good practice for livestock farmers who cultivate Leucaena. The policy endorsed in November 2004 \"addresses the need for land use management recommendations over the location, design and management of plantings of the shrub legume leucaena to reduce the weed risk. The policy has been developed by Government agencies with responsibilities for natural resource management following consultation with industry, local governments and community groups\" (NRM, 2005). 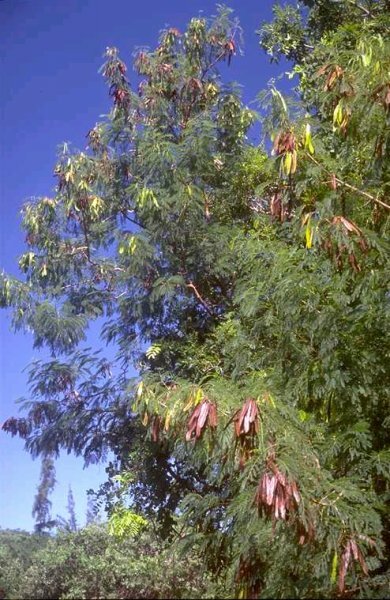 A Risk Assessment of \rLeucaena leucocephala for Hawai‘i and other Pacific islands was prepared by Dr. Curtis Daehler (UH Botany) with funding from the Kaulunani Urban Forestry Program and US Forest Service. The alien plant screening system is derived from Pheloung et al. (1999) with minor modifications for use in Pacific islands (Daehler et al. 2004). The result is a score of 15 and a recommendation of: \"Likely to cause significant ecological or economic harm in Hawai‘i and on other Pacific Islands as determined by a high WRA score, which is based on published sources describing species biology and behaviour in Hawai‘i and/or other parts of the world.\"
Biological: A bruchid beetle seed predator, Acanthoscelides macrophthalmus has been deliberately introduced and released in South Africa as a biocontrol agent and the same insect has been accidentally introduced to Australia. The accidental spread of the psyllid insect defoliator Heteropsylla cubana in the mid 1980s can cause cyclical defoliation, but does not kill trees and the psyllid appears to have been brought under control by a number of generalist local (and in some cases introduced) psyllid predators and parasites. 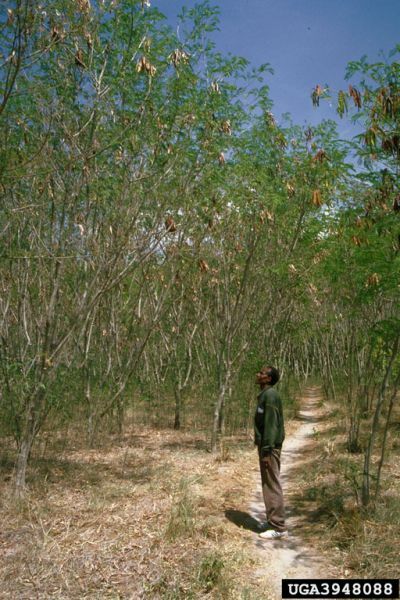 Integrated management: Once established, Leucaena is difficult to eradicate. It resprouts vigorously after cutting. Cut stumps need to be treated with diesel or other chemicals. Furthermore, the soil seed bank can remain viable for at least 10-20 years after seed dispersal. Informations on Leucaena leucocephala has been recorded for the following locations. Click on the name for additional informations. Hughes, C. E. 1998. Leucaena. A Genetic Resources Handbook. Tropical Forestry Papers 37. Oxford Forestry Institute, Oxford. 274pp. Hughes, C. E. and Jones, R. J. 1999. 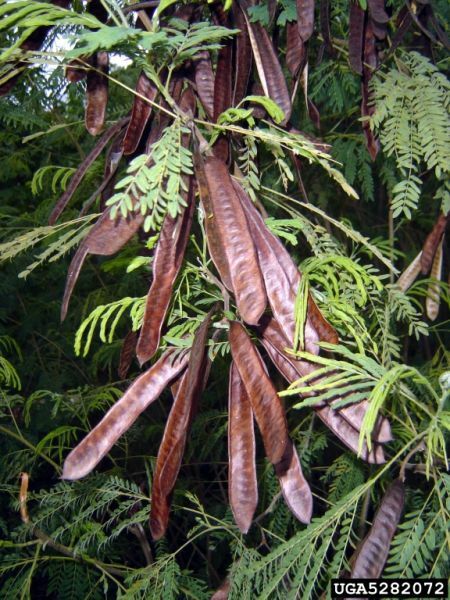 Environmental hazards of Leucaena. In Shelton, H. M., Gutteridge, R. C., Mullen, B. F. and Bray, R. A. (eds.). Leucaena - Adaptation, Quality and Farming Systems, Proceedings of a Workshop, Hanoi, Vietnam, Feb. 1998. ACIAR. Jones, R. J. and Jones, R. M. 1996. Thickening up of Leucaena stands in Australia - a caution. LEUCNET News 3: 19-20. Kueffer, C. and Mauremootoo, J., 2004. Case Studies on the Status of Invasive Woody Plant Species in the Western Indian Ocean. 3. Mauritius (Islands of Mauritius and Rodrigues). Forest Health & Biosecurity Working Papers FBS/4-3E. Forestry Department, Food and Agriculture Organization of the United Nations, Rome, Italy. Natural Resources and Mines (NRM) Environmental Protection Agency Department of Primary Industries Queensland Government, November 2004. 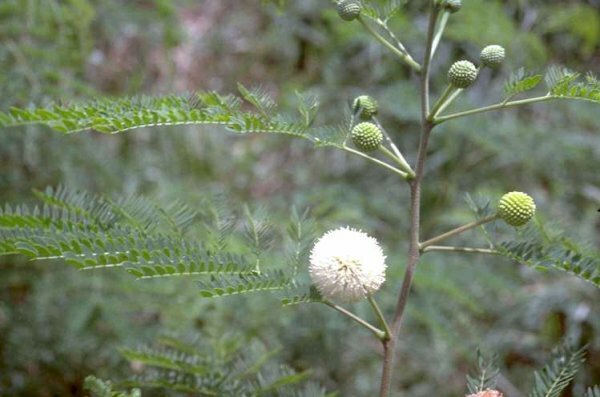 Policy to Reduce the Weed Threat of Leucaena. Neser, S. 1994. Conflicts of interest? The Leucaena controversy. Plant Protection News South Africa 6: 8. Neser, S. 1996. Acanthoscelides of Leucaena in South Africa. LEUCNET News 3: 16-18. Available from: http://www.hear.org/pier/species/leucaena_leucocephala.htm [Accessed 5 March 2011]. Rauzon, M. J. and D. C. Drigot., 2002. Red mangrove eradication and pickleweed control in a Hawaiin wetland, waterbird responses and lessons learned. In Turning the tide: the eradication of invasive species: 381-388. Veitch, C.R. and Clout, M.N.(eds). IUCN SSC Invasive Species Specialist Group. IUCN. Gland. Switzerland and Cambridge. UK. Renter�a, Jorge Luis; Rachel Atkinson, Ana Mireya Guerrero, Johanna Mader 2006. Manual de Identification y Manejo de Malezas en las Islas Gal�pagos. Segunda edici�n, Fundaci�n Charles Darwin, Santa Cruz, Gal�pagos, Ecuador. Una gu�a con ilustraciones que provee informaci�n para el control efectivo de las peores plantas invasoras en Gal�pagos. Esta dise�ada para los agricultores y personas involucradas en conservaci�n. De una forma clara y simple se describe los m�todos de control manuales y qu�micos; tambi�n incluye 8 especies que potencialmente podr�an ser un problema para Gal�pagos. Lenguaje: Espa�ol. Renter�a, Jorge Luis; Rachel Atkinson & Chris Buddenhagen., 2007. Estrategias para la erradicaci�n de 21 especies de plantas. Fundaci�n Charles Darwin, Departamento de Bot�nica. Programa de Especies Invasoras en Gal�pagos potencialmente invasoras en Gal�pagos. El presente documento proporciona planes de manejo y el costo para la erradicaci�n de 21 especies que se encuentran presentes en Gal�pagos. Los planes fueron desarrollados como parte del proyecto ECU/00/G31 Control de las especies invasoras en el Archipi�lago de las Gal�pagos , suscrito por el Gobierno Ecuatoriano, representado por el Ministerio del Ambiente, con el Fondo para el Medio Ambiente Mundial (GEF). El Proyecto es implementado por el Programa de las Naciones Unidas para el Desarrollo (UNDP), tiene como instituciones ejecutoras al Servicio Parque Nacional Gal�pagos (SPNG), Instituto Nacional Gal�pagos (INGALA), Servicio Ecuatoriano de Sanidad Agropecuaria-Gal�pagos (SESA-Gal�pagos), y Fundaci�n Charles Darwin (FCD). Los planes de manejo representan proyectos en diferentes estados de desarrollo y dimensi�n. Tres de estos proyectos ya han sido desarrollados completamente, trece est�n en proceso y cinco a�n no se han iniciado. El costo y tiempo para la erradicaci�n varia considerablemente seg�n la especie y se muestra la importancia econ�mica que implica desarrollar proyectos de erradicaci�n tan pronto las especies son detectadas. Sheil, D. 1994. Naturalized and invasive plant species in the evergreen forests of the East Usumbara Mountains, Tanzania. African Journal of Ecology 32: 66-71. Smith, C. W. 1985. Impact of alien plants on Hawaii s native biota. In Stone C. P. and Scott J. M. (eds.) Hawai i s Terrestrial Ecosystems: Preservation and Management. University of Hawaii: 60-69. Soria, M. C.; M. R. Gardener and A. Tye., 2002. Eradication of potentially invasive plants with limited distributions in the Galapagos Islands. In Turning the tide: the eradication of invasive species: 381-388. Veitch, C.R. and Clout, M.N.(eds). IUCN SSC Invasive Species Specialist Group. IUCN. Gland. Switzerland and Cambridge. UK. Walton, Craig, 2003. Leucaena (Leucaena leucocephala) in Queensland. Pest Status Review Series. Department of Natural Resources and Mines, Queensland. Cronk, Q. C. B. and Fuller, J. L. 1995. Plant Invaders: the threat to natural ecosystems. Chapman and Hall, London. 165pp. Felfili, J. M. and da Silva, M. C. 1990. A vegetacao do arquipelago de Fernando de Noronha. Plan de Manejo do parque nacional marinho de Fernando de Noronha. IBAMA-FUNATURA, Brazil: 37-49. Gargominy, O., Bouchet, P., Pascal, M., Jaffre, T. and Tourneu, J. C. 1996. Cons�quences des introductions d esp�ces animales et v�g�tales sur la biodiversit� en Nouvelle-Cal�donie.. Rev. Ecol. (Terre Vie) 51: 375-401. Summary: Consequences to the biodiversity of New Caledonia of the introduction of plant and animal species. Gordon, D. R. and Thomas, K. P. 1997. Florida s invasion by non-indigenous plants: history, screening and regulation. In Simberloff, D., Schmitz, D. C. and Brown, T. C. (Eds.) Strangers in Paradise: impact and management of non-indigenous species in Florida. Island Press, Washington DC, USA: 21-37. Department of Plant Sciences, University of Oxford, South Parks Rd., Oxford, OX1 3RB.